If a more impressive online bookie has launched in recent years then we are yet to hear about them. MoPlay have set themselves up as a bookie for the next generation, and they have come out all guns blazing with a well-rounded fully functioning product including one or two impressive extra features from the word go. It is clear that a lot of investment has gone into the brand, and this shows not only on the website, but also in the odds and offers available, and not least the app. This is a fine piece of work and a product that serves independently as well as going hand in hand with the desktop site. 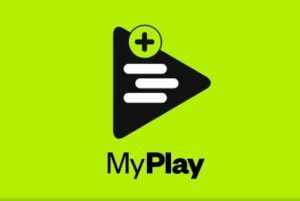 With such a strong start, MoPlay are worthy contenders for your patronage, and getting in early could work to your advantage as they clearly have big long-term plans. There are certainly plenty of sports for the bettor to explore at MoPlay, around 35 of them to be precise, and market depth is impressive here too. They aren’t quite biting at the heels of the industry veterans but they may well be starting to make them twitchy. A lot of new sportsbooks stay away from Horse Racing but this bookie has had a good stab at it from the off. UK and Ireland races come with best odds guaranteed (not ante-post) and although you don’t get full market coverage there is plenty for the casual bettor to enjoy, including one or two international meetings from South Africa and Dubai. Elsewhere Football and Basketball are the main focus, but there is plenty more to whet your appetite. You will find every noteworthy Cricket, Tennis, and Golf fixture, as well as a decent selection of non-sporting Specials and niche sports like Bandy, Futsal, and Floorball. As you would expect, market depth in these areas is much lower than the more popular sports, where you can find upwards of 150+ markets for top games. You can expect top odds on markets for Man Utd and Watford since Moplay are global betting partners with both of them, and there are also plenty of MoPlay Upgrades (specials) to explore and take advantage of most days. There are also plenty of promotions which, when used in conjunction with the already favourable odds, could really bring home the bacon. The odds are only available in decimal format as far as we could see, but since MoPlay are on something of a recruitment drive those odds are well worth looking at, often ranking among the best available. The bad news is that live streaming isn’t available yet, not even for horse racing, but that’s about as far as the bad news goes, and we wouldn’t be surprised to see streaming introduced in the not too distant future. That aside, the live betting experience on the whole is superb. 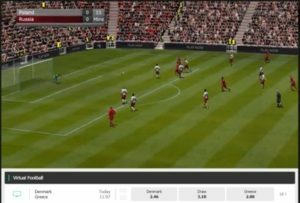 The interface is one of the most usable out there and if you are betting on a big football game, for example, there is a lot to get stuck into. The Match Tracker, in particular, is a nifty tool. Live stats are decent, and there is a more comprehensive stats tool available from the main menu which goes into a lot more historic detail if you like a bit of analysis. It’s the way the interface knits together that makes it so successful, though – it really flows. 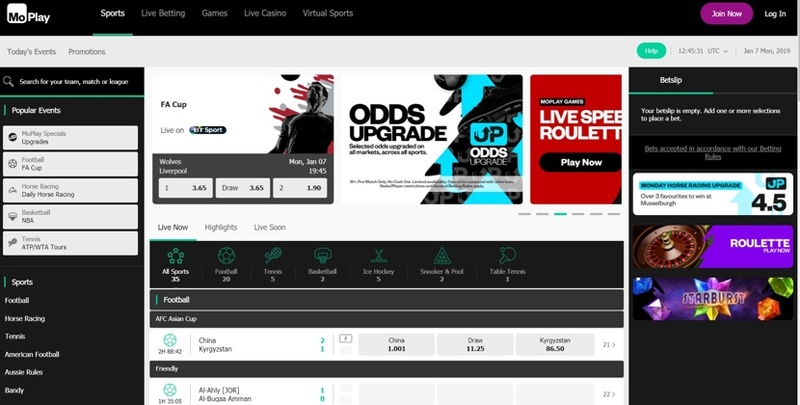 You can choose from an Overview, Event View, and Live Schedule, and from there the screen splits into three identifiable sections so that you can track other live events you might be interested in, manage the markets of the event you are currently looking at, and follow the games progress/stats and your bet slip all from one place. It’s the complete package. Market depth for live fixtures is expansive and there are even fast markets available. You will no doubt be able to get more from some of the big hitters in the industry, but most of us won’t really need it. This is one area in which we aren’t so pleased with MoPlay. Our main issue is the fact that they allow withdrawals to be cancelled, and we all know how that can turn out. Timeframes are soggy too. The range of payment options is average, the standard punter won’t have any issues, and low deposit minimums open up the field for those of us with less spare cash in our pockets. Note that all withdrawal timeframes below do not account for MoPlays processing time with could add an extra 24-48 hours on top. They could do with tightening this up, otherwise punters could end up waiting a week for their money. Since they were doing everything else properly from the launch date they added a Casino and a Live Casino too. Like the rest of the site, it is still in its infancy so there are only a little over 150 games available in total, but they are from a few well established and popular providers, including slots, jackpots, roulette, blackjack, and a few other card and table games. The Live Casino includes the odd exclusive table but the whole thing is provided by Evolution gaming so it will be as good as you will find anywhere else. A nice companion to the sportsbook for the sports bettor who also enjoys the occasional spin of the reels. There aren’t as many betting features here as you can find elsewhere it’s true, but there are more than you will find at some bookies who have been around for much longer. 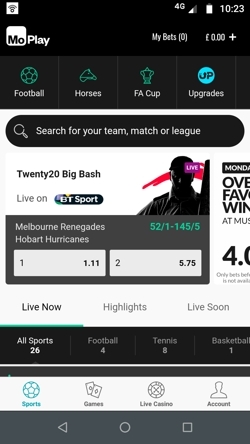 Once again, MoPlay have hit the ground running with their betting features, and we are sure these will be built upon in the not too distant future. Build your own bet with multiple selections on a single game only on the app. 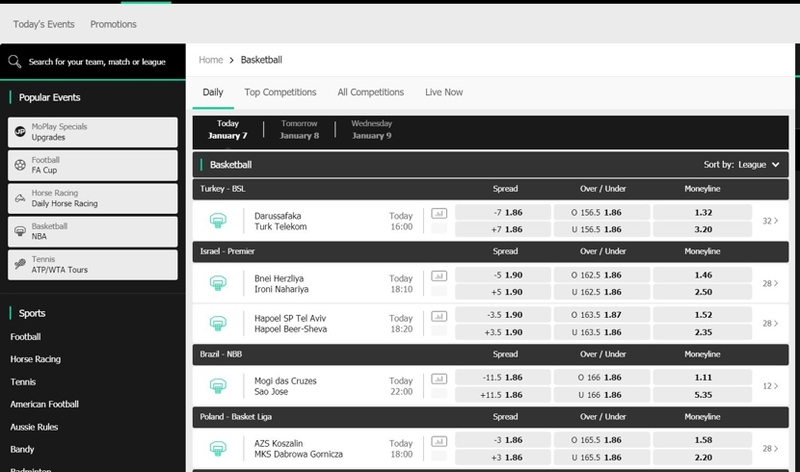 It’s available for football and basketball games, and it’s as simple as choosing a few selections from the choices available to build your own bet the way you want it. Once you have selected your game there will be a switch that you need to flip to enable the bet builder to work, and once you have done so your selections will be priced up instantly. If you like the look of it add it to your bet slip, choose your stake and you’re away. This is not only fun, but it gives the punter more of a say in their betting activity; instead of your choices being dictated to you, you get some freedom to play around with things to suit you. At the moment there are only three different sports to bet on in this area; Football, Horse Racing, and Greyhounds. We imagine this will grow over time, but even with this limited selection it is worth a look if you enjoy virtuals. The graphics are lovely and crisp and there is a nice big viewing window so the action is clear. We found the commentary to be better than average as well. Racing virtuals are always difficult because they can only refer to each runner by number (because none of them are real, remember) but the level and tone feel good here. New events start every three minutes and if you just want something to watch you can join an event after it has started. The staple feature of any good sportsbook these days, Cash Out is available at MoPlay. 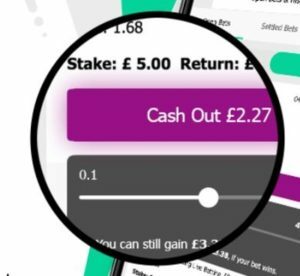 This feature means that the bet stays active after it has been placed because the punter has the freedom to go back in and settle the bet early if they choose. This has two main benefits: firstly you can minimise losses if your selection doesn’t look like it is going to come through; secondly, you can guarantee a win by using it at the right time. It won’t always be your best option, and the amount you win or recoup could be minimal depending on the situation at the time, but on the other hand, it could be a complete life saver when used correctly. 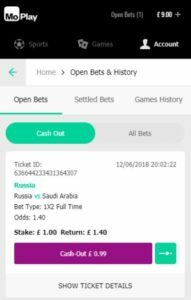 If you are in two minds about your bet, or you have slightly lost confidence in your selection perhaps, you can cash out part of your bet and leave the other part in. Effectively, this splits the bet into two: the amount you leave in will remain at the original odds and your potential winnings will be adjusted accordingly; the amount you take out will be settled at the odds available at the time and will reflect the situation as it currently stands. You can play around with the percentage you leave in and take out, and it’s possible to win on both. If your bet was £10 on a 1-0 win to Huddersfield at 3/1, but you get cold feet and settle £5 at 85 minutes with Huddersfield 1-0 up, you will still make a profit on that £5 (a smaller one, granted). If they go on to win 1-0 as predicted the £5 you left in will be settled at the original odds of 3/1. MoPlay came to the industry as a mobile first bookie, and their desktop website is left with an uninspiring aesthetic design, a feeling of emptiness, and little personality. This is not necessarily a bad thing, however, because it moves at lightning pace and it is extremely clear to take in all of the options in front of you as there are no distractions. Clutter will never be an issue here. Just because it’s plain, that doesn’t mean there isn’t plenty of content packed in. The site runs on the SBTech platform – another clear statement of intent from MoPlay – so it is capable of a lot straight out of the box. The layout works in the punter’s favour. You won’t get much help from the sports A-Z but once a category is selected you will get an idea of the market depth for each fixture and be able to open up the stats where available. The interface really comes into its own at this point; from one category to another you can browse daily fixtures over the next 7 days, fixtures by competition, or view any games that are currently live. Limited further categorisation is available for each choice, too. Once you are looking at a specific event, markets can be organised by lots of genre’s (halves, goals, specials etc), at which point expandable drop-down menus break the markets up further and reveal/hide the odds as you dictate. We would recommend using these tools as otherwise you will be scrolling for eternity. In all honesty, it does feel basic. There are zero cool features to get excited about but it’s about a user-friendly as it gets, and given that MoPlay are such a new online bookie they have certainly come out swinging. The mobile site works in almost exactly the same way as the desktop site, but since the whole brand was designed with mobile in mind it feels like a better product on the small screen – especially if using the app over the mobile website. The experience feels more ergonomic on the whole, and because there is less screen space to fill that basic sense of emptiness no longer applies, it’s much livelier. It’s also a nippy little customer, although it could probably be faster still since the casino is all wrapped up in the same product which no doubt adds to the workload. In a slightly odd move MoPlay have done away with a menu button, instead including an All Sports option within the quick links scroll bar. This is fine, it was just a bit confusing at first; just make sure you make use of the integrated ‘back’ button rather than reloading the homepage every time. Navigation and organisation features use the same combination of categories and collapsible drop-down menus as the desktop site, so this is all good news for the user and means you can get to your bet within 20 seconds of logging in. Maybe even quicker if you use the search bar instead. We usually prefer to use mobile websites over apps just because of storage space (unlimited internet contract, don’t be jealous) but for MoPlay we would recommend using the app. The mobile site is great, but the app is a superior product and worth the space in our opinion. Plus, there’s a pumping intro video after you first install it which was fun and unexpected. Totally useless, mind, but we enjoyed it nonetheless. 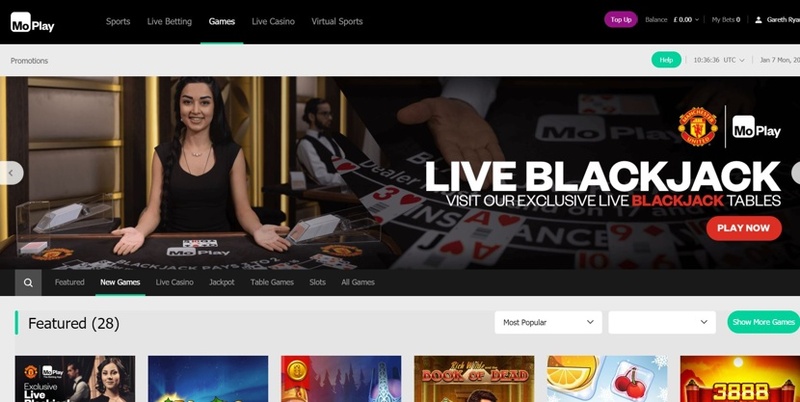 MoPlay represents the first foray into the online gambling arena by Addison Global Limited, and since they only launched the site in 2018 their journey has just begun. They actually launched in the middle of the World Cup fever pitch. They are one of the latest mobile first bookies to enter the industry, targeting young millennials and trying to cater to modern day needs, and they have an experienced team behind them. Juergen Reutter is the CEO, and before taking the reign at MoPlay he spent almost 5 years in a top position at William Hill. Straight out of the gate MoPlay signed deals with both Manchester United and Watford F.C as their global betting partner which shows clearly the level of their ambition. In terms of sponsorship, if this is how they started you can be sure we will see their name a lot more in the future. MoPlay are officially based out of Gibraltar but have a c/o address in London. At the moment MoPlay are probably best suited to the recreational modern-day, tech savvy gambler. They are not yet going to have the depth or reputation to tempt the professionals amongst us or those who treat sports betting as a serious pastime away from what they know, but if there is an event of any note happening in the sporting world you can be sure it will be available to bet on in some capacity. Those who prefer to bet on their phone/tablet rather than settling in for a marathon desktop session will also be suited to MoPlay, and if you want good odds this is the place to come. Live Chat is your only option if you run into problems at MoPlay, although the good news is that the team are great and the chat client is fantastic to use and connects instantly. We were initially disappointed with this since the bookie shows so much promise in other areas, but then in this increasingly virtual world is there any need for all of the other options? 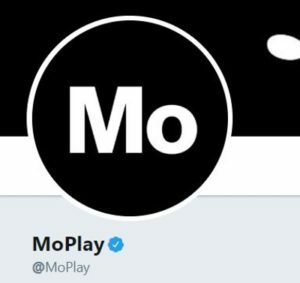 MoPlay will obviously have a telephone number and e-mail address if they need to use it, but at the moment it is not readily available to customers. There as a Twitter account although this isn’t really geared towards support, but if you click Help on the website you will open up the Knowledge Base – or the FAQ to you and me. If you thought the rest of the site was plain you ain’t seen nothing yet, but that’s beside the point. The FAQ is split into sensible categories as well as being searchable, and the whole thing is intuitive to use. Each answer is well crafted too, so it actually helps rather than just stating the bleeding obvious like so many others. Live Chat – This is the only contact option so it’s a good job it’s fast. Find it in the Help section down at the bottom of the new window. E-mail – At present, there is no email address on the site, not even a contact form. Phone – Afraid not, gotta keep it virtual at MoPlay. @MoPlay – Clearly trying to emulate other popular bookies accounts here, it feels a bit try hard to us. Nevertheless, there are lots of meme’s and sports betting news to keep an eye on.